With apologies to Mugsy Bogues and Manute Bol (who had a soft-spot for gambling, it was written), an account of historical note has recently been relayed to us by the mouth of Gilbert Arenas. Yes, Gilbert Arenas. Then-Wizards center JaVale McGee had beaten Crittenton out of $1,100 in a card game. Wizards guard Earl Boykins loaned McGee $200. McGee didn’t immediately pay back Boykins as he won the money and an argument blossomed. Arenas says he wasn’t involved in the actual bet. 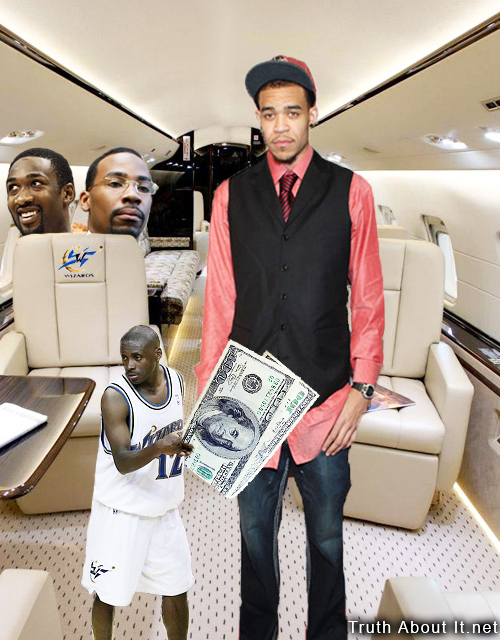 But yes, this documented instance of a $200 loan between the 5-foot-5 Earl Boykins and the 7-foot-1 JaVale McGee is likely the biggest height difference amongst intra-NBA player airplane card game loans, ever. Again, with apologies to Bogues and Bol, or perhaps Earl Boykins and Zydrunas Ilgauskas for that matter. Funny how in the aftermath of the locker room gun incident, one coverage result was analysis of the game of Bourré and how its intricate rules might have contributed to the escalation of the dispute. Thanks to Arenas, it doesn’t seem like it was about the card game at all, but, rather, it was about one nit-wit’s inability to realize that he should pay back a loan (McGee), one uninvolved instigator’s interjection to the dismay of at least one involved (Arenas), and one hot-head’s lack of understanding of how choices in the present could not only ruin his career, but also his life (Crittenton). Funny, indeed. But hey, history was made… and Photoshop was there to cover it.